Remove unwanted hair from your face, back, chest, arms, underarms, bikini line or legs with advanced laser hair removal. Laser hair removal permanently reduces unwanted facial and body hair, in fewer treatments and with more comfort than is possible with traditional (Waxing or electrolysis) procedures. Laser is also safe to use on all skin types even darker skin. This treatment uses powerful light at specific wavelengths to target and destroy the hair follicles without harming surrounding tissue. 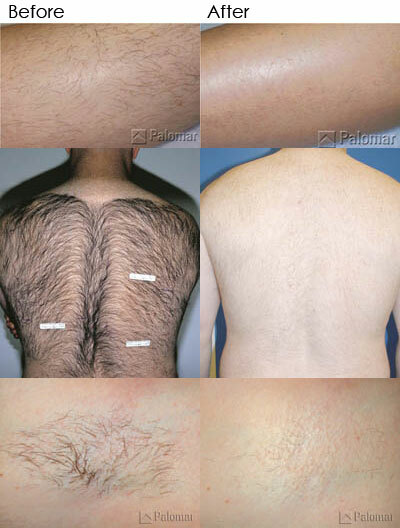 Laser hair removal offers the following advantages over shaving or waxing. Our skilled team is trained to determine the appropriate laser settings and wavelength for your unique skin type and hair colour. Laser hair removal requires repeat visits (usually 4-8 or more with maintenance treatments) to achieve desired results. Why? At any given time, only about one-third of the hair follicles are in the active growth stage that respond well to the laser, so at least four treatments are essential for permanent reduction depending on how much or how little hair you have, how light or dark your hair and skin tone is and your age will also depend on how many laser treatments you will need to achieve desired results. The FDA has approved lasers for hair removal to get rid of up to 80% of hair. This means that after 4-8 treatments you may still have up to 20% or more hair remaining and touch-up sessions may be needed every 3 months to every few years depending on the individual. You have three different hair growth cycles: Catagen, Telogen, and Anagen so everyone needs at least 4-8 sessions spaced 4-12 weeks apart to destroy each growth stage while in they are active to match the growth cycles of the follicles for the part of the body that is being treated. After you have achieved your desired results you might need follow up treatments 1-2 times a year or every few years depending on the area treated. Liberate yourself from shaving and waxing. Book your complimentary laser hair removal consultation and patch test today!